I commend Mr. Simmons on his success; he had a goal and was determined to achieve it, and did! Unfortunately, I cannot give this book as high of a rating as I had expected that I would. I received this book as one of the Goodreads Giveaways and was disappointed that it was a proof. There were a lot of editing mistakes, which made it challenging to read. As businesswoman myself, I do not agree with some of the points Mr. Simmons makes. To achieve success, you must work at it. I agree with Mr. Simmons on that point. However, the journey to obtaining your success is not always a matter of 'working hard.' I see it as working smart. You are the one who makes the decision, but to achieve your success, there are a variety of people that influence your success or failure. Mr. Simmons appears to be of the mindset I consider 'old thinking' when it comes to business. Thanks to the internet and other resources, the ability to create your own business or product is much different, especially with the need for investors or initial capital. Also, his limited suggestion of investing in the stock market and basic insurance that he describes is very restricting. I am a person who chooses to look at the positive in every situation. There are no problems, only situations, challenges and opportunities. At times, Mr. Simmons came across pessimistic, stereotypical and uneducated for a man who has had the experience he has had. I disagree with his suggestions to women and children entrepreneurs, ultimately because he is not a woman and his statements are from a male perspective. A negative mindset, for anyone, can hinder your growth in both personal and business aspects of your life. 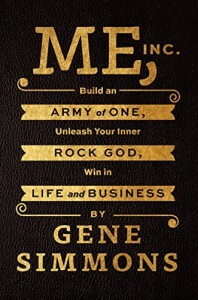 To me, personally, there are many more appropriate business books for new and aspiring entrepreneurs than Mr. Simmons'. He attempted to relate his points to the book Art of War and he was unable to mesh the two concepts together as accurately as I anticipated. To start your entrepreneurial journey, I strongly recommend the following books instead: The Magic of Thinking Big, Ask and It Is Given, The Law of Success in 16 Lessons (1925 edition), The Power of Positive Thinking, The Magic of Believing, The Happiness Advantage, Creative Intelligence and The 7 Habits of Highly Effective People.